The third style of presentation for the large photographs installed at Hiscock and Barclay LLP is where the metallic inkjet paper is laminated to a 1/4-in plexiglass and mounting frame is attached to the back. The metallic paper really pops with detail and color and the mount has a nice clean modern look. The example photo here is installed in the reception lobby. I call it “Reflecting Skyline” an… iconic Rochester view taken at the time of the International Canal Festival. The finished work is 22 x 76-inches. This style was used for seven of the 22 photos that were installed. Jason finished the installation this afternoon and we are all pleased with how everything looks in place. I plan to do more of this “face-mount” style with my exhibits at Image City. I have made photos with this style as large as 36×72-inches for other clients. 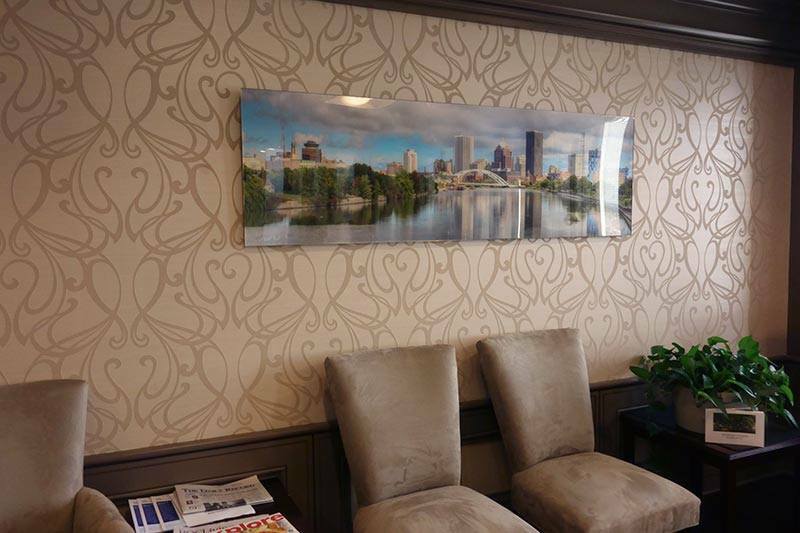 This entry was posted in Sales Success and tagged Face-Mounted Acrylic, Rochester, Skyline. Bookmark the permalink.